I used to make these little cupcake bites from Bakerella quite a few times on my own (you can see my halloween version here). I feel it is a very relaxing process to make these because there are so many steps, but yet it’s very simple to make. It’s almost like an assembly line. Such order can make you feel like everything is in your control. 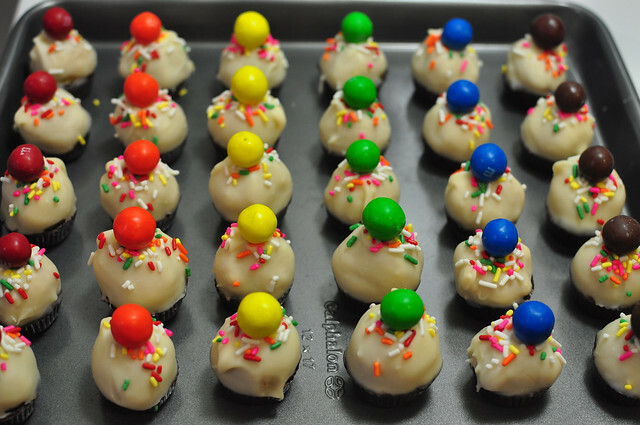 You can change the colors of the candy melts or the cake and frosting in the middle, but the whole process usually stays the same, which I like. I also like making the chocolate go on perfectly (no cake is showing). It is quite difficult, but once you get it, it feels so good! This time, I decided to go very simple with a white chocolate topping and normal chocolate bottoms. I always go for the dark chocolate on the bottom, just because I love that stuff! 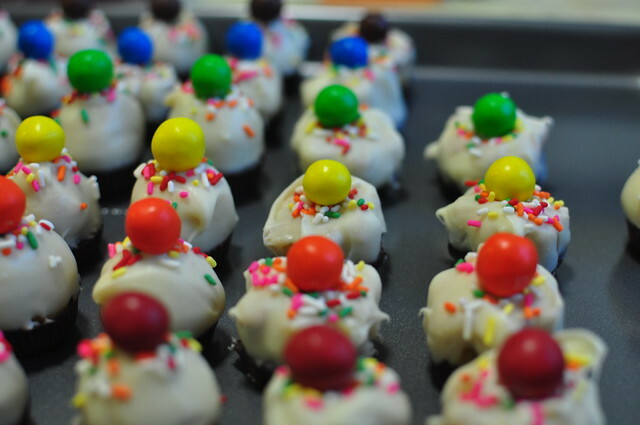 Then I got some rainbow jimmies and pretzel M&M’s for the topping. 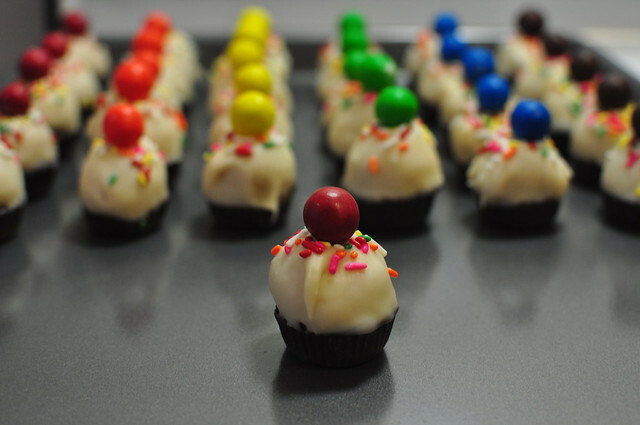 The result is cute little colorful cupcakes. They’re perfect for celebrating birthdays or any time you want to get a burst of happy. When you take a look at these, you can’t help but smile. I usually make these with the candy mold tray, but I really wanted to try using a mini flower cookie cutter like Bakerella does for her cupcake pops. I happened to stumble upon a set from Wilton at Ross, and decided to try it out. Turns out it was harder than I thought. I think with a few more times using this, I can master it. But in the mean time, D- had a great idea and make it just like a cookie, but dip it like I did with the other cupcake bites. I thought it turned out pretty cute! Sure makes me happy to make these and I encourage you to try decorating them like this! Happy dipping! This entry was posted in Cupcakes, Recipes and tagged bakerella, baking, cake mix, candy melts, cupcakes, recipes on July 22, 2012 by Krystal.